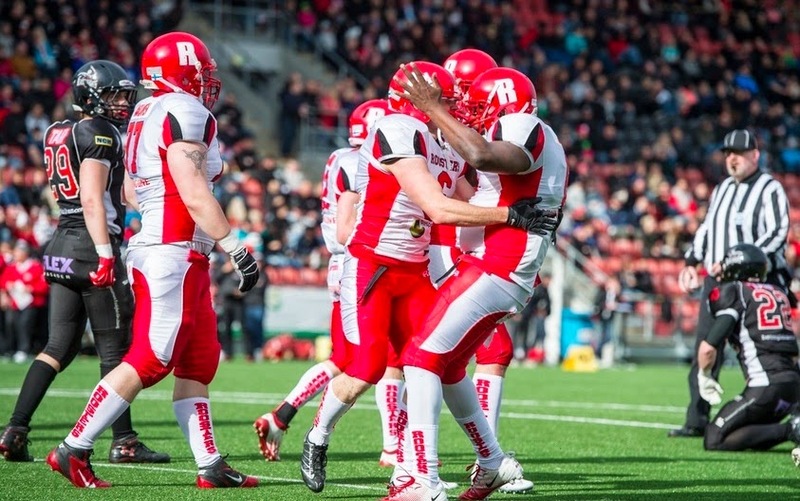 The reigning Finnish Champion Helsinki Roosters opened the IFAF Europe Champions League with a magnificent victory Saturday, 5/3. The Roosters outscored the Swedish Örebro Black Knights 61-43 in a high scoring battle on the Black Knights home turf Behrn Arena. A large crowd attended the match and the Black Knights organized an online LIVE stream where more than 1,000 people cheered on their teams remotely. Quarterback Robert Johnson led the Roosters attack with many nice looking drives, particularly in the first half of the game as the Roosters took a big early lead 41 -16. The Roosters offensive line provided Johnson with plenty of time as the Roosters built a comfortable lead. Rooster receivers Markus Lievonen, Kimi Linnaninmaan, Ville Palikainen, Lauri Pehu-Lehtonen all scored touchdowns. The Black Knights quarterback Andrew Shoop was hurried most of the game as the Roosters defensive was capable of causing severe pressure on him throughout the match. Shoop threw for many long yards in the first half, but could not keep his team in the match in the first half. Black Knights running back Veikka Lehtonen brought the team hope with some long runs in a marvelous second quarter. Lehtonen came through the middle of the line and go past an open field tackle to with a magnificent stiff-arm to a Rooster defender. Lehtonen gained many yards to in the game, but the running game suffered some miscues. In the first half, the Black Knights running game seems to have some miscommunication as Lehtonen and Shoop running back-quarterback exchanged were bungled. Despite the large deficit, the Black Knights came out fighting in the second half. Quarterback Shoop and Lehtonen had a team on a strong offensive pace, and after a few quick scores they were only down 37-48 going into the fourth quarter. The Black Knights attack stood out with their large TE Cesar Hebel , who was often Shoop’s favorite target. Serbian import QB/WR Strahinja Stepovic also managed to score. Black Knights comeback attempt continued deep into the fourth quarter. The host team forced the Roosters into a 3rd and 10 with only 11 minutes left in the game., but Johnson found American import RB Jaycen Taylor’s for a touchdown. This score put the game out of reach, as the Black Knights offense faltered on the next drive. On the whole, the Roosters looked quite formidable, even if the Black Knights did make it a match in the second half. The team’s offense did not play without error, but it was enough against the Black Knights on Saturday. The running game was adequate when needed and QB Robert Johnson played the expected strong and mature game . In the other leg of the IFAF Europe North Group, the reigning Swedish Champion Carlstad Crusaders defeated the champion of Denmark Copenhagen Towers 34-24 . The Crusaders and Roosters with meet in the in Helsinki in two weeks. The winner of this match will win the IFAF Europe Champions North Group and will move on to the IFAF Final Four, which will take place in July in Le Mans, France. Orebro Black Knights: Strahinja Stepovic 12, Veikka Lehtonen 12, Andrew Shoop 6, Cesar Hebel 6, James Grufman 3, Daniel Rödjemyr 2, Filip Berglund 2.